The Bubble Tea craze in Singapore seems to be getting stronger and stronger each year with many interesting concepts hitting the market. From cheese-foam, fruit/tea-based, durian-flavoured to chrysanthemum pearls, Bubble Tea now comes in all shapes and flavours, and is considered as an essential to many. You can tell its popularity from the never-ending queue outside any Bubble Tea shop. Like any other people, I’m also a Bubble Tea fanatic and can drink up to 4 per week. So, here’s my TOP 8 picks to get your Bubble Tea cravings sorted out here in Singapore! Isn’t my face looking more like a pearl now? HAHA! Have you been to these Bubble Tea places before? Cloud Fruit Tea, Fun Fruit Tea, you can pair your drinks with freshly baked sweet and savoury breads! 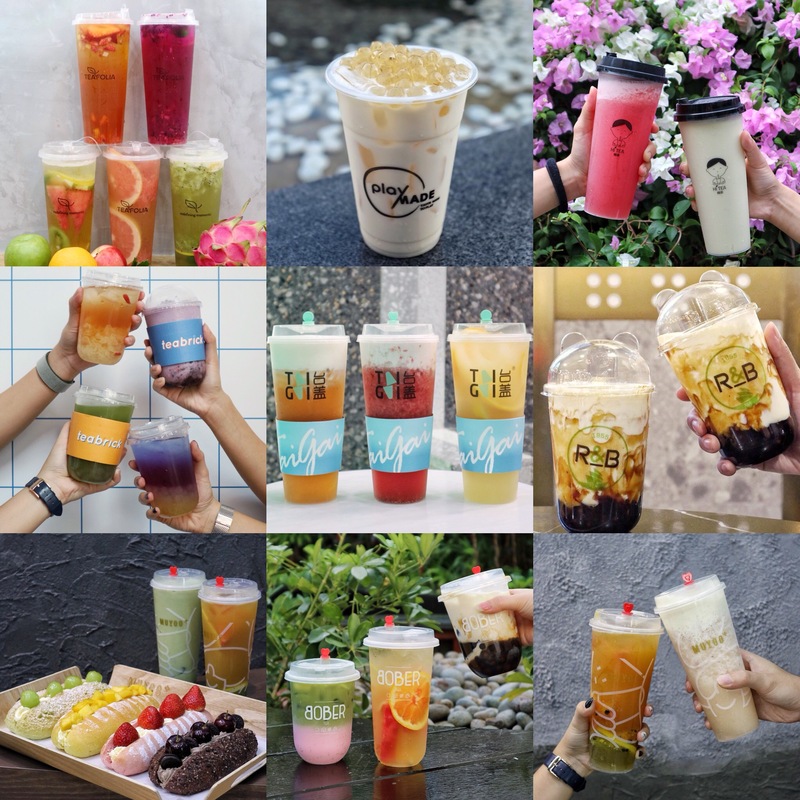 Refreshing Fruit Teas Teafolia will be celebrating their one year anniversary this September and to date, they have 3 outlets in Singapore – Tampines, Yishun and Bedok Mall! Known for serving premium fruit teas, they are a force to be reckoned with! Perfect during a hot sunny afternoon! Instagram-worthy Bubble Tea The new Bober Tea outside Bishan Mrt Station focused on providing affordable, high-quality and tasty blends of Tea with a Gist of local flavour inside. Drinks are extremely instagrammable! Chrysanthemum Series with Chrysanthemum Pearls PlayMade by 丸作 originates from 丸作 Tainan, Taiwan and they pride ourselves in ensuring that everything is made by hand, and with all-natural ingredients. Pearls are all made in house! Their new Chrysanthemum series is so good that I’ve been back for like the fifth time! Recommended it to my friends and all of them LOVED it! They have also opened two new outlets in Ang Mo Kio and Serangoon! Slow cooked to perfection in R&B巡茶’s unique brown sugar, the soft and chewy pearls boast a caramelised note, and their aroma wafts through the air. The interior of the cup is also coated with a brown sugar glaze specially imported from Taiwan. Chilled fresh milk is then poured into the cup, creating a stunning visual that is reminiscent of a tiger’s bold stripes, hence inspiring the drink’s Chinese name: 老虎出巡. A layer of velvety and savoury cheese cream is then added on top. Finally, brown sugar bits are sprinkled and torched into a crisp, caramelised crust, adding another dimension of flavour and a crunchy texture to this one-of-a-kind drink. TaiGai is famed for using generous fresh fruits in their floral-scent teas and for its signature creation, the FRUITY MILKY KISS, a rich yet refreshing combination of blended fruits and velvety milk cheese crown that rests atop the fruit teas. The Strawberry Pulpy Kiss, a signature tea and the brand’s best-seller, has a strawberry-blended milk cheese crown to complement the premium tea. Did you just say Durian-flavoured Bubble Tea? Yes, your ears aren’t playing tricks on you! HiTea Singapore Hi Tea Singapore, a local tea brand that specialise in cold brew teas and fruit teas has their rendition of Premium D24 Durian Tea which might sparked an interest in Durian fans! If you’re not into durian (me no like it), you can go for their Avocado Snow and Watermelon Snow! First Kombucha Tea Bar in Singapore The new kid in town and not your conventional kind of bubble tea! With no added colouring and flavouring, the drinks from Teabrick is healthier, contains probiotic and antioxidants! Perfect for the health-conscious working crowd in the CBD! Previous PostMasizzim: Unveils Brand New Menu with Exciting Dishes such as Shabu-Shabu, Crabmeat Egg Roll, Bulgogi Rice Balls and many more! Next Post(New) Indulge SG: This stall in Upper Thomson Kopitiam serves HUGE, Restaurant-Quality & Affordable Rice and Soba Bowls!